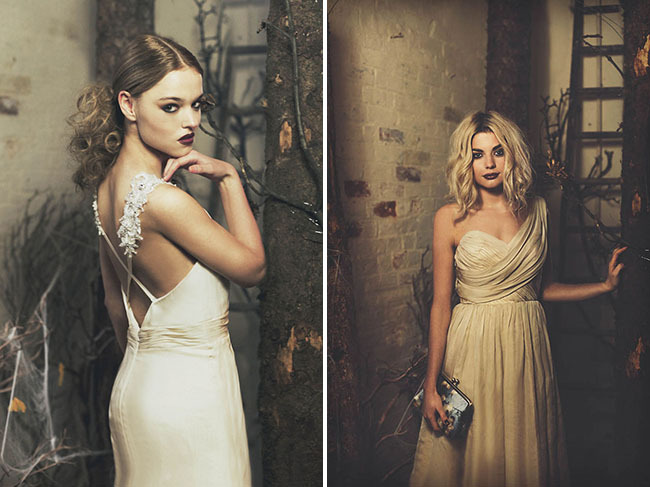 We are big fans of Ivy & Aster’s stunning gowns here at GWS, so we’re super excited to be sharing an exclusive first look at their newest collection, captured by Rosie Hardy, with you all today! Launched in 2010, Ivy & Aster’s bridal and social lines have become a favorite of brides around the globe. Starting with an air of romance and adding a dash of whimsy, Ivy & Aster delivers a novel spin on traditional wedding attire. Delicate silk fabrics are fashioned in modern, refined silhouettes, giving the perfect mix of ethereal and wearable. According to Ivy & Aster, the darling is in the details. They love a hint of sparkle, rows of ruffles, a velvety swiss dot, essentially anything that is one part sweet and one part sass. Their accessories borrow from vintage nostalgia, give a nod to current fashion trends, and were designed to help you style out a unique and personalized look for your wedding day! I & A: I was so excited to work with photographer Rosie Hardy because I felt her style was so different than a lot of bridal imagery out there now and I wanted something different. Ideally we would have shot outside but the cold and rainy season was here so Rosie decided to create the outdoors inside! We worked in a great studio with old mill floors and huge windows so you really do feel as if there is a forrest inside a building, as if nature has taken hold of the studio. A friend of Rosie’s brought in tree trunks all the way from Scotland! Furthering the idea of a forrest and nature, Rosie created three sets to capture Spring, Fall and Winter. The images to me are very ethereal and almost magical. It worked perfectly to showcase our dresses! I & A: We always try and stay true to our design philosophy which incorporates a beautiful dress, in a soft, flowing fabric, but is affordable and therefor approachable for a lot of customers. Adding to that, we love to drop in a new novelty fabric or a new embellishment or fabric treatment, which makes the dresses feel modern with a nod to nostalgia. We want the dresses to be simple and really let the bride wearing them become the showcase. We also create a lot of accessories that you can mix and match and really make each dress reflect your own personal style. GWS: What do you want your customer feel when views your new campaign? I & A: We always want the bride to get caught up in the story created with the imagery but we want her to picture herself in the moment. Hopefully these capture how she wants to feel on her wedding day and inspire her to live in this once-in-a-lifetime dream of choosing a wedding gown and creating an unforgettable day. 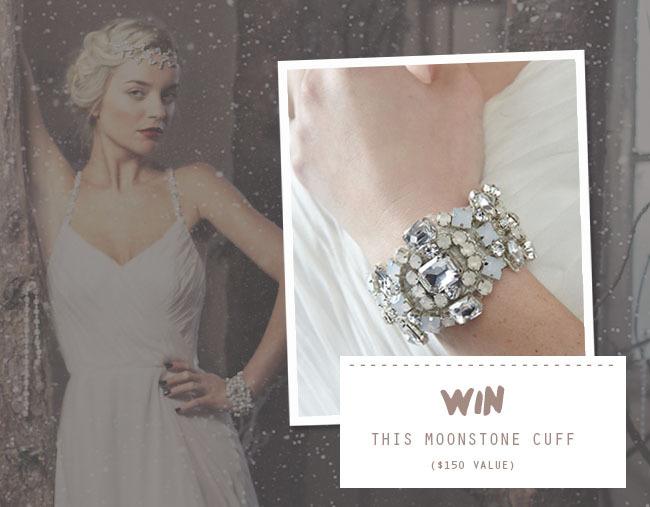 And we’re excited to let you know that Ivy & Aster will be selecting (from a random drawing) three Facebook followers to receive a FREE Moonstone Cuff (as seen above)! There’s only one rule to qualify: you must ‘Like’ Ivy & Aster’s Facebook page. Thanks so much to Ivy & Aster for letting us in on this fun opportunity! Be sure to follow @ivyandaster on Twitter + Instagram to stay up to date + check them out on Pinterest, too! So much beautiful inspiration! Drawing will be held on February 1st, 2014.